Today is all about labneh. 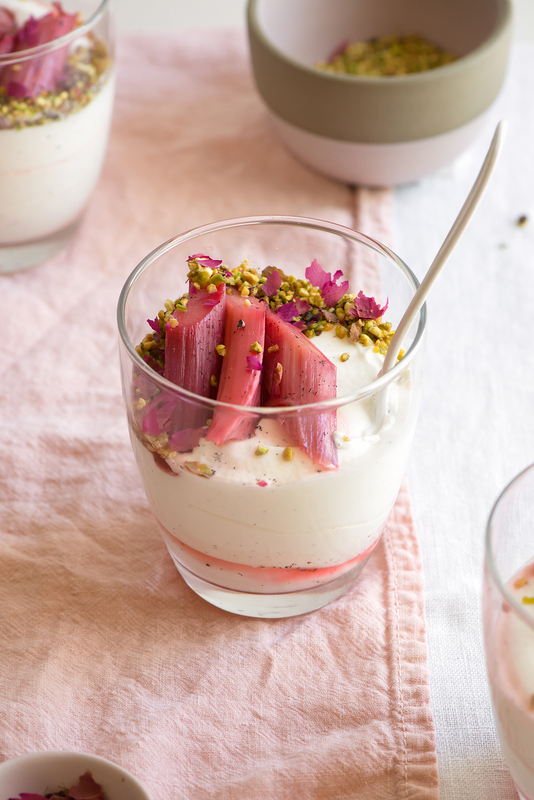 Sweet Labneh Mousse with Orange Blossom Rhubarb. It all came about by happenstance too. A couple of weeks ago, I was brunchin’ with a friend in the Kansas City River Market and stumble upon a Middle Eastern grocer tucked away in the market. Intrigued by the fresh pita bread that was on display I decided to go in and take a look around. I’m so glad that I did! A wonderland of new flavors; massive amounts of nuts on display, candies, cookies, colorful drinks, breads, spices, and cheeses. Anyone who loves food understands the wonderment that is discovering new ingredients to explore. It’s akin to traveling to another country without having to pay for the actual plane ticket. While ogling the imported pistachios I came across something that I’ve always wanted to try: Labneh. It’s a popular Middle Eastern yogurt “cheese” that’s super creamy and thick (like Greek yogurt, but even more so). My years spent drooling over labneh recipes in magazines had officially come to an end. I scooped up a fresh container (along with the fabulous Cortas orange blossom water that I had never been able to find in stores either + a big paper bag of vibrant pistachios). The verdict: Labneh is amazing. I finally know what all the raving is about. Ultra creamy rich goodness that will forever grace my refrigerator shelves. I can’t wait to make savory meals with this; however, for now it’s the star of this dessert. When whipped into a mousse it transforms into an even more ethereal texture. Topped with roasted rhubarb, plus a splash of fragrant orange blossom water, for a spring experience. 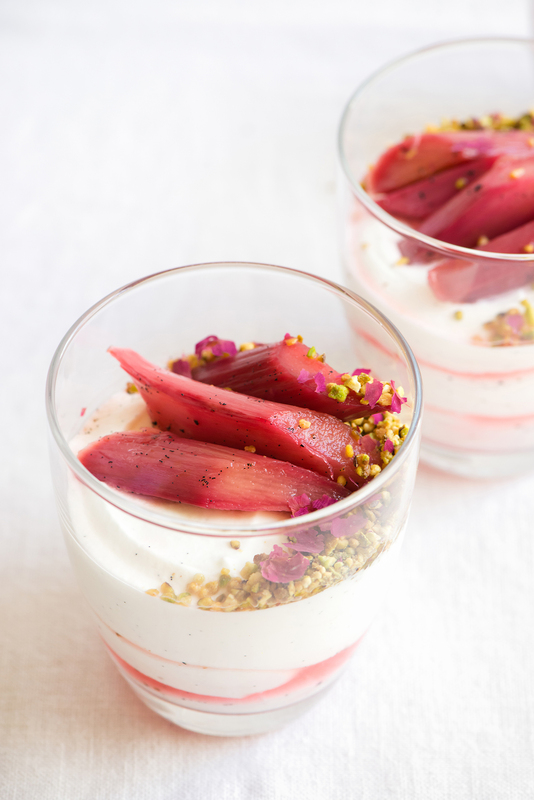 The tangy rhubarb gives off the most beautiful orange blossom aroma and the sweet mousse melts on the tongue. Eat for breakfast, snack, or dessert. It doesn’t matter when, just be sure not to miss out on a sweet labneh experience. *Orange blossom water is water distilled with the essence of flowers from orange trees. It’s very potent, so a little goes a long way. Try and find a high quality bottle for this recipe. I love this brand. Cortas has a beautiful scent and flavor that no other brand really comes close to (at least that I’ve found so far). Orange blossom water can be found at Middle Eastern markets, sometimes the Middle Eastern aisle at specialty grocery stores and online. Skip the generic kind- it’s awful. *Labneh can also be found at Middle Eastern markets, specialty grocery stores, or you can make your own at home. For this recipe, I used Ulker Labneh that I picked up at my local Middle Eastern market (along with the bottle of orange blossom water and some gorgeous pistachios). Preheat oven to 350F (180C). Slice rhubarb into 1 – 2 inch long pieces. In a baking pan, toss together the rhubarb, sugar, vanilla bean seeds and pod, sea salt, and orange juice. 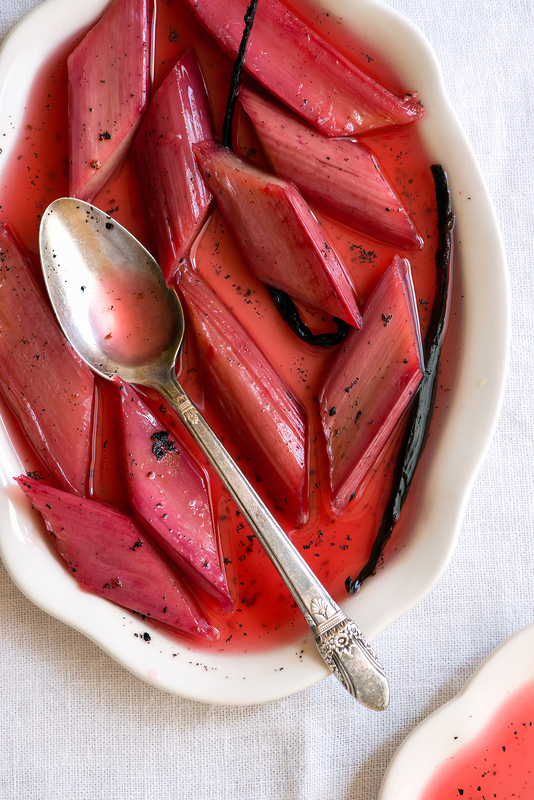 Roast rhubarb for 18-20 minutes, without stirring, until tender and juicy. Remove from oven and drizzle orange blossom water onto the roasted rhubarb. Gently, swirl the baking pan around to evenly coat the rhubarb in orange blossom water juices. Let cool. In the bowl of stand mixer, with the whip attachment, combine all the ingredients. Whip, on medium-high, until mousse reaches medium peaks and is light and fluffy. Tip: Keep an eye on the whipping process to avoid over-whipping and ending up with stiff and broken mousse. If you do over-whip, then simply whip in extra cream until it comes back together. Using a piping bag, or a spoon, fill the bottom of a glass with a small amount of mousse. Using a spoon, drizzle in some roasted rhubarb juice. Finish filling the glass with a thick layer of mousse (about 4 oz/113g total). Top with 3-4 pieces of roasted orange blossom rhubarb. Sprinkle on any other toppings desired, such as finely chopped pistachios. Serve and enjoy. Labneh mousse can be prepared a day in advance. If preparing in advance, fill the individual glasses with mousse, wrap the top of each glass with plastic wrap, and then refrigerate until ready to eat. Next day, roast rhubarb and top mousse with pieces right before serving. Gah! This looks amazing. I wish I could eat dairy…Maybe I could make it with this awesome new ultra-thick coconut milk yogurt I found. Do you think that would work? Love your photos as always! Thank you, Sasha! Coconut milk yogurt sounds incredible. This style of mousse is very simple and just involves whipping air into the ingredients, so by all means try giving that coconut milk a whip. If it’s similar to thick coconut cream, then my assumption would be that it’ll work. If not, spread it out and top with roasted rhubarb anyway. ;) Thanks for stopping by, lady! mm i haven’t had labneh either! will have to hunt some down though (: and that rhubarb is such an amazing color! i’d like to use it on anything and everything, please. 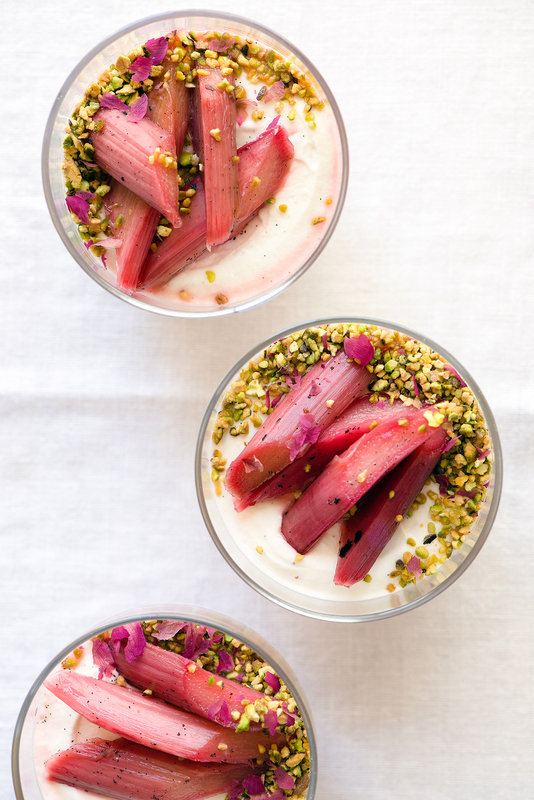 Yes, to rhubarb on everything right now! That labneh hunt will be worth it. It’s so good. Although, it looks like it’s easy to make at home too, so I’ll have to try that sometime. This is stunning! I love love labneh since my days in Dubai, when I ate it almost everyday. And now I can’t find any here in Canada. This is making me so nostalgic.